RVUNL Result 2019: Below are the latest results published by RVUNL - RVUNL - Rajasthan Rajya Vidyut Utpadan Nigam Ltd. / www.jaipurdiscom.com. The recent result announced by the organization is Junior Accountant Appointment Order 2019. JVVNL Junior Accountant Appointment Order 2019: Jaipur Vidyut Vitran Nigam Ltd. (JVVNL), Rajasthan Govt. has announced the Result on 04 Mar 2019 for JVVNL Junior Accountant Exam 2018. 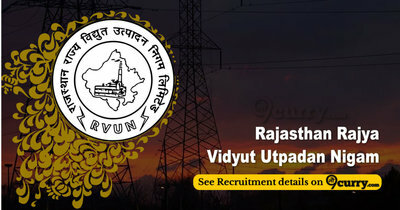 RVUNL Stenographer, Junior Assistant / Commercial Assistant Result 2019: RVUNL - Rajasthan Rajya Vidyut Utpadan Nigam Ltd. has announced the Result on 05 Feb 2019 for the exam . RVUNL Technical Helper Final Result Second List 2019: RVUNL - Rajasthan Rajya Vidyut Utpadan Nigam Ltd. has announced the Result on 24 Jan 2019 for Technical Helper Final Result Second List 2019 . RVUNL Jr. Assistant/ Commercial Assistant-II Shortlisted for DV 2018: RVUNL - Rajasthan Rajya Vidyut Utpadan Nigam Ltd. has announced the Result on 13 Dec 2018 for the exam . RVUNL Jr. Assistant/ Commercial Assistant-II Result 2018: RVUNL - Rajasthan Rajya Vidyut Utpadan Nigam Ltd. has announced the Result on 13 Dec 2018 for the exam . RVUNL Technical Helper Final Cutoff Marks: RVUNL - Rajasthan Rajya Vidyut Utpadan Nigam Ltd. has announced the Result on 28 Nov 2018 for RVUNL Technical Helper Exam . RVUNL Informatics Assistant Result 2018: RVUNL - Rajasthan Rajya Vidyut Utpadan Nigam Ltd. has announced the Result on 03 Oct 2018 for the exam . RVUNL Technical Helper Result / Marks 2018: RVUNL - Rajasthan Rajya Vidyut Utpadan Nigam Ltd. has announced the Result on 25 Sep 2018 for the exam . RVUNL Informatics Assistant Result 2018: RVUNL - Rajasthan Rajya Vidyut Utpadan Nigam Ltd. has announced the Result on 05 Sep 2018 for Informatics Assistant Exam 2018 . RVUNL Stenographer Result 2018: RVUNL - Rajasthan Rajya Vidyut Utpadan Nigam Ltd. has announced the Result on 05 Sep 2018 for Stenographer Exam 2018 . RVUNL Junior Assistant/ Commercial Assistant II Results 2018 (Phase-I): RVUNL - Rajasthan Rajya Vidyut Utpadan Nigam Ltd. has announced the Result on 31 Aug 2018 for the exam . RVUNL JE Result 2018: RVUNL - Rajasthan Rajya Vidyut Utpadan Nigam Ltd. has announced the Result on 25 Aug 2018 for Junior Engineer Exam 2018 . RVUNL Junior Chemist Result 2018: RVUNL - Rajasthan Rajya Vidyut Utpadan Nigam Ltd. has announced the Result on 16 Aug 2018 for Junior Chemist Exam 2018 . RVUNL Assistant Engineer Result 2018: RVUNL - Rajasthan Rajya Vidyut Utpadan Nigam Ltd. has announced the Result on 16 Aug 2018 for Assistant Engineer Exam 2018 . RVUNL Accounts officer and Junior Legal officer Result 2018: RVUNL - Rajasthan Rajya Vidyut Utpadan Nigam Ltd. has announced the Result on 08 Aug 2018 for Accounts officer and Junior Legal officer Exam 2018 . RVUNL has announced the Result on 15 Jul 2017 for the exam. JVVNL has announced the Result on 15 Jul 2017 for the exam.